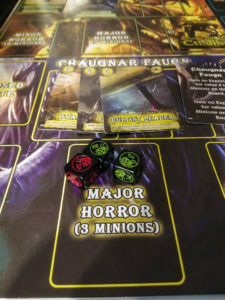 In The Cards of Cthulhu, players take on the role of intrepid investigators trying to keep the minions of four (five with the expansion) cults from opening gates for their Elder Gods. It is a threat management game, as each draw from the deck brings new threats to deal with, or help in the form of items and followers. It is intended as a solo game, but there are rules for higher player counts. I have found it to be an enjoyable experience: quick to set up; easy to play; with a decent amount of tension and decision making. Cards of Cthulhu has enough flavor to keep this Lovecraft fan interested. 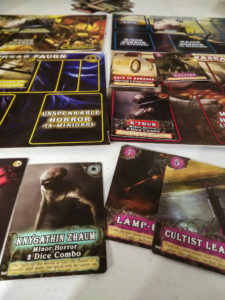 Cards of Cthulhu is — as the name suggests — an an almost entirely card driven game. The two hundred card deck (with the expansion) consists of: Minions; Minor, Major and Unspeakable Horrors; Gates; Followers; and Items. On each turn the player draws cards from the deck and then resolves them. 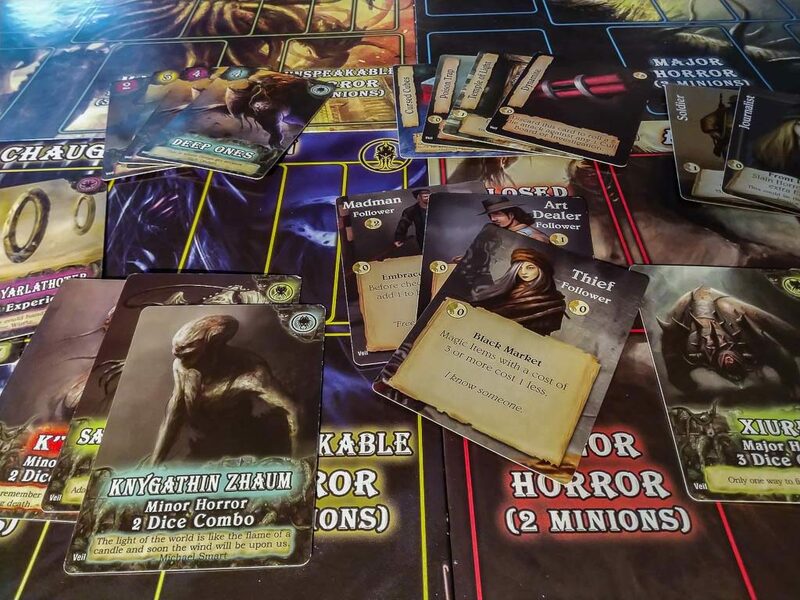 Minions, Horrors and Gates are played on the appropriate Cults’ Board. Items and followers can be purchased. Dice are used to resolve combat against Minions and Horrors. If any Cult’s board ever has five minions present, they summon their Elder God and the game ends in failure. Minions may also trigger the awakening of Minor, Major and Unspeakable Horrors. Gates force the drawing of additional cards, which may potentially add to the turn’s difficulty. The key to the game is to manage each Cult’s minions. The major resource in the game is “Experience,” which is tracked with thematic coins. Experience is gained by closing gates and killing Minions and Horrors. Experience is spent on items, followers, extra actions, extra dice and other things that can help deal with threats and mitigate the luck of the draw and of the dice. There are three kinds of dice in Cards of Cthulhu: Body (red), Health (green) and Spirit (white). Each is numbered 1 – 6. When attacking minions, such as a Mi-Go or Cultist, you roll one body and two health dice to try to meet or exceed the cards’ value. Roll higher than the value, and the minion is defeated. Dice can be used individually, or in combination. Combining dice values is the only way to defeat a Minion with a value of 7 – 10. Horrors are defeated by rolling dice combinations. 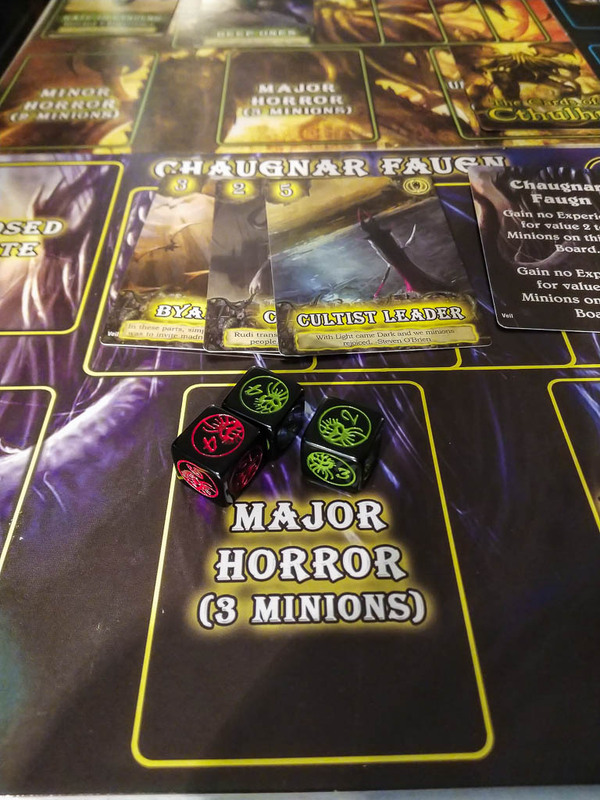 A Minor Horror is defeated with a two-dice combo — for example, a pair or threes, or a run of 2-3. A three dice Major Horror requires three of a kind or a run of three dice. Unspeakable Horrors require four of a kind or a run of four dice. Spirit Dice can be purchased with Experience. These add to the dice pool and are obviously the only way to defeat an Unspeakable Horror. Players may also want to add to their dice pool when facing a pile of high value minions. Cards of Cthulhu is not an overly difficult game, but I have found that it creates an enjoyable feeling of tension and suspense. It also has enough flavor to satisfy my Lovecraft itch. Minions pile up on Cult boards, forcing desperate attempts to reduce their number. Opened gates accelerate the dangers. Horrors compound the difficulty by “shielding” their minions (there is a combat priority — horrors, then minions). Followers must be sacrificed. The day can be saved with the right magic item, or a stick of dynamite. Bad luck (and what Lovecraft story doesn’t have its share of bad luck) in the form of bad die rolls and unlucky card draws work against you. The artwork is well-done and evokes for me the proper Lovecraftian feel. Overall component production is good, but not great. Card quality is adequate. They are slick and glossy and sturdy enough for many, many plays. I have trouble hand shuffling them, though. Because it is important to the game for them to be really well shuffled (so you don’t get a long run of one Cult’s cards that you can’t deal with), I have resorted to several rounds of pile shuffling before a game. Mash shuffling might also be an option. I am also convinced that the cards from the expansion are of a slightly different thickness than the base set. That doesn’t matter in terms of game play, though. The next card on the deck is the next card on the deck. The Cult boards are sturdy cardboard, but I find I have to counter-bend them to make them lie flat. I also think that there really aren’t enough Experience tokens. In truth, though, I’m not even sure why there are tokens. You could just as easily keep the cards of the cultists and horrors you kill near you, and return them to the discard pile as you spend experience. Gates, Minions and discarded followers and items are worth one each. 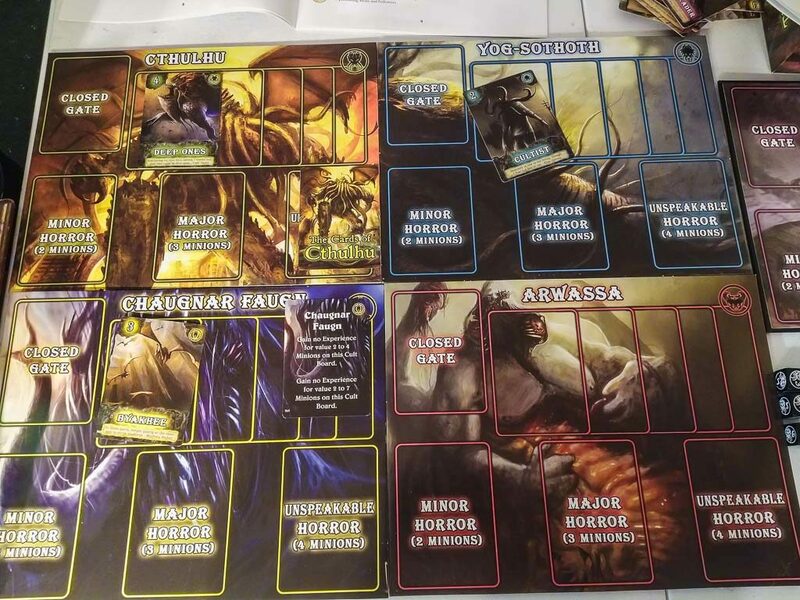 Horrors have an experience value equal to their dice combo value, which is printed on the card. You might have to make “change” with a four dice Unspeakable Horror, but that also would be easy enough. One nice feature of the Beyond The Veil expansion is that it lets you adjust the duration of the game. A short game involves using a quarter of the cards and drawing 7 cards per turn. A mid-sized game uses half the deck and draws five cards. A full game uses all of the cards and draws four cards per turn. I would recommend picking up the expansion.